Posted in Black Dragon, Catznip, Second Life, Viewers. Saturday was the annual Mole Day. Inara has an article on Mole Day with all the details. SL Moles are the guys that build all the SL Governor’s public works things. We hear little about them, but they are a key part of Second Life™. The Machinimatrix Blog got hacked. It is fixed and all is well again. (Ref) The Machinimatrix people did not recommend changing passwords. But, it is probably a good idea. NiranV the author of the Black Dragon Viewer has an article up on Projector Lights. Part of the information is about setting up Preferences in the BD Viewer. Then Niran gets into setting up the projector lights. Projector lights are way neat and greatly improve the appearance of a scene. They make night and club scenes much more dramatic. Catznip R12.1 (beta1) has been posted for patrons (64bit only). We’re testing dramatically faster texture rezzing (new, Catznip unique OpenJpeg). Prejump & landings animations optionally disabled and a slew of crash fixes. Texture rendering speed was the obstacle to my use of this viewer. Kitty Barnett, the author of Catznip, is looking for some financial support. So, this beta is only available to those that contribute through Patreon. This is the 8th anniversary of Myst Online: Uru Live. Get details on the Myst Online website, Anniversary. Events through to February 7th. Gacha Garden has a new event in progress. There are dozens of free gifts spread around the garden. There is a shopping guide here. I’m not much of a gacha fan. I tend to only go when there is an exclusive item from a designer I like only available as a gacha. But, Gacha Garden is fun. Join the group. Lots of trading happens there. If you have an item you want to sell, this is a good place to start. Posted in Catznip, General News, Second Life, Viewers. 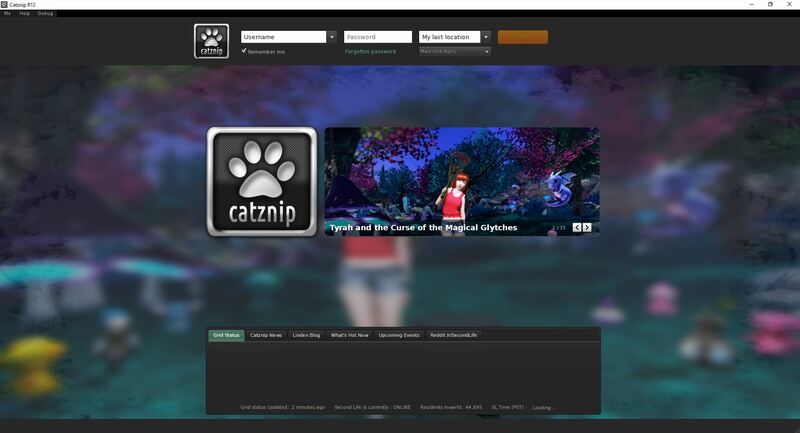 Catznip Viewer R12 – Awesome or Not? This is the first final release in something like a year… It has great stuff in it. Definitely worth a try. And for anyone playing the inventory maintenance game, this is likely the winner’s choice of viewer. You can download the viewer here: Catznip Viewer Download. If you have the beta links, forget them. They have stopped working. While 64-bit is the preferred choice, those of you with HD Graphics may have to run the 32-bit version. There is a notice on the download page explaining the problem and what you can do. The download is about 98MB if that matters these days. Install runs, no problems. My first login I butter-fingered the password. I mistakenly added a space at the end that didn’t belong, assumed it wouldn’t matter, it did, and then I could not get the viewer to accept the password without the space. The Login button would not wake up. I had to restart the viewer. This is a quick viewer. In my standard test places, I get 107 FPS on my porch, 122 FPS in my green-screen room at 1500m, and with 12 avatars in my field of view, it drops to 19-33FPS. The first two are faster than any of my other viewers by 20 to 30%. The ‘avatars present’ slowdown is typical. The viewer uses its own cache. For this viewer, I have an empty cache. So, I was thinking scene render is a bit slow because of that. However, on return to a place, it renders things fast. But, textures are lagging. After 3 or 4 hours of use, I was unhappy with the speed of Catznip scene renders. I went shopping. That’s when the problem became unbearable. During that time, I switched back and forth between Catznip and Firestorm. I was checking to see if my connection was acting up, memory loading up, the region was just slow, or what. I decided it is just Catznip. However, running the cursor over a thing I wanted to render helped and was quick to fully render whatever. But, it would not stay rendered. So, both Firestorm and the Linden viewers were rendering the shopping areas in the Region Evocative, the SWEAR stores for men are there, way faster than Catznip and they stayed rendered. So, doing cam-shopping with Catznip and my SpaceNavigator is out. I ran into texture thrashing. Thrashing may not be the best word in this case as I think of ‘thrashing’ as a faster thing. But, it is the words we use to describe the problem. When textures did finally render, they would drop back to a blurry render. Then on a somewhat slow cycle, they would render, stay clear for a bit, then go blurry. They might remain blurry indefinitely. 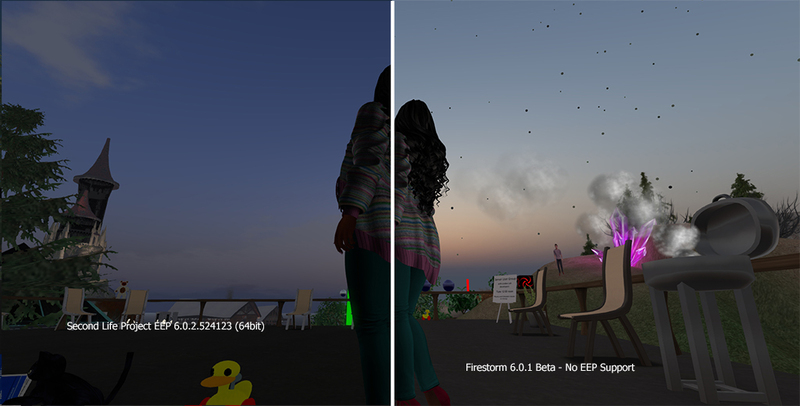 I seldom see texture thrashing in ether Firestorm or the Linden viewer. I tried the trick of removing all the HUD’s, restarting the viewer, leaving chat closed… nothing seems to help. Profiles come up WAY faster in Catznip than in Firestorm. Is that just me that has slow, way slow, profile renders in FS? I use web profiles, not the legacy. So, that may not be a fair-to-Firestorm comparison. Catznip’s Profile panel is more the legacy type profile. I’m not a fan of the Profile panel in Catznip. But, I like fast. Inventory search has an upgrade or two to make finding stuff easier and improves how results are displayed. The Quick Preferences is awesome. Ctrl-Shift-P to open. Inara explains how to use the panel, so I’ll skip the details. There are other WAY handy features not found in other viewers. So, this could become the shopaholic’s viewer of choice. Inara is, apparently, a heavy user of Firestorm’s Photo Tools. I am too. What I use most is Firestorm’s change to WL Sky, which in Catznip is the Fixed Sky setting. So, for the majority of my use, the Catznip Quick Pref’s are good enough. And the Windlight presets, while extensive, have been cleaned up. RLVa is available. It is off by default. You’ll find it in Preferences->Catznip->General. A viewer restart is required when changing the setting. Inara is adopting Catznip as her alternate viewer. For her Firestorm remains the preferred Viewer with Catznip in second place. For me, the slow Catznip render during shopping kills it for me. The Linden viewer remains my primary backup. Other viewers, I consider as specialty viewers, best for specific tasks. Black Dragon for photos when I need to adjust poses. Catznip when I have a lot of inventory maintenance to do. Linden for playing with new features, think animesh. Firestorm is my primary viewer. I’ll do more testing with Catznip throughout the week. I am hoping it is something transient. The features in Catznip I could get really attached to. I think they are awesome. Posted in Catznip, Second Life, Viewers.